To Cite: Zendehdel R. Oxidative Damage Modeling by Biomonitoring of Exposure to Metals for Manual Metal Arc Welders, Health Scope. 2014 ; 3(3):e16440. doi: 10.17795/jhealthscope-16440. Background: Welding fumes consist of a wide range of complex metal component. Metals induced chronic obstructive pulmonary disease, bronchitis, metal fume fever, cancer, and functional changes in the lung. Since oxidative stress plays a role in this pathogenesis, it is characterized by airflow limitation. Objectives: This study focused on the anticipation of the oxidative stress biomarker in welders by assessing the amount of urinary metals and spirometry airflow index. Materials and Methods: We measured malondialdehyde (MDA), as a biomarker of oxidative stress, in urine from20 manual metal arc welders of a petroleum tank making plant. For controls, we recruited 20 ministerial workers who were matched with welders. Urine content of chromium, cadmium, and lead as well as spirometry airflow parameters such as expiratory volumes were applied to partial least square regression (PLS) model for predicting oxidative stress biomarker. Results: The Results revealed that metal urine concentration in welders was higher than controls but only the difference in chromium concentration was significant (P < 0.002). In the range of metals exposure, induction of oxidative stress for exposed group was observed by increase in urine MDA (11.17 ± 4.23 and 4.83 ± 1.82 mM in welders and controls, respectively; P < 0.01). Information of the metals urine concentration and FEV1/FVC, FEF25%-75% of spirometry index were subjected to PLS analysis to predict oxidative stress biomarker. This model was capable of predicting the concentration of MDA with the regression of R2 = 0.91. Conclusions: PLS predicts the oxidative stress biomarker with an acceptable sensitivity. According to our research, we can assess the level of oxidative stress as the sign of multi-metal toxicity by following the common biomonitoring assessment. This method could be useful for further engineering control procedures. Exposure to mixture of metals is a serious health problem. Occupational exposure to multi-metals occurs in welding, melting, and mining employees (1-3). Manual metal arc welding (MMAW) is one of the world's most popular processes to weld iron, stainless steel, nickel, and aluminum alloys (4, 5). Depending on the joining metals, component of electrodes, welding technique and condition of welding process, welding fumes consist of a wide range of complex metal component. Cadmium, chromium, lead, nickel, magnesium, and other metals are commonly detectable in welding exposure; stainless steel welding mostly contain chromium fume (6, 7). Metals can induce different diseases such as chronic obstructive pulmonary disease (8), bronchitis (9), metal fume fever (10), cancer (11), and dermatitis (12). Exposure to fumes increases the risk of lung cancer. The International Agency for Research on Cancer (IARC) classifies welding fumes as “possibly carcinogenic to humans” (13). Based on experimental studies, DNA interaction, DNA damage, and generation of reactive oxygen species (ROS) in metal exposure could promote the carcinogenicity effect (14). Oxidative stress is a toxicity mechanism that results from the imbalance between free radical production (e.g. ROS) and antioxidant defense in cells. Oxidative stress target wide range of macromolecules including nucleic acids (15) and proteins (16), which mediates the induction of several pathogeneses. It has been documented that metals-induced damage can be related to oxidative stress generation (17-19). Some studies have confirmed that occurrence of oxidative stress in metal exposure is relevant for human health assessment (20-22). Moreover, recent studies have confirmed a correlation between spirometry indexes and oxidative stress damage (23). Partial least square regression (PLS) is a common multivariate data modeling in the field of chemometrics method, which is based on other methods including principal components analysis (24). In the present study, we evaluated urine concentration of cadmium, chromium, and lead as well as spirometry index in MMAW employee of a petroleum tank making (PTM) factory. These parameters were presented to PLS model for anticipating malondialdehyde (MDA) as oxidative stress biomarker of multi-metal toxicity. The aim of this challenge was to predict oxidative damage in welders as an early effect of multi-metal exposure using routine hygiene biomonitoring. We used 1,1,3,3-tetraethoxypropane, 2-thiobarbituric acid (TBA) (Sigma), ammonium pyrrolidine dithiocarbamate (APDC), triton X-100, nitric acid, methyl isobutyl ketone, n-butanol, chromium, cadmium, and lead standards (Merck, Germany). We recruited 20 MMAW workers from a PTM factory with the mean age of 38.6 ± 7.4 years and at least one year in the profession. We obtained 10 mL urine from each of them. Age-and socioeconomically-matched controls (P values < 0.01, n = 20 was recruited from ministerial employee who were not occupationally exposed to physical or chemical compounds. Two subject of welder with over five year history of cigarette smoking were matched with control. In all subjects, pulmonary function parameters (i.e. FEV1/FVC, FEF25%-75%) were tested by spirometry. Metals in urine samples were extracted by methyl isobutyl ketone solutions of metal-APDC complex (25). Chromium, cadmium, and lead concentrations were assayed with an AL2200 Aurora flameless atomic absorption spectrophotometer. For this assay, a mixture of 1% TBA and urine was heated in a boiling water bath. Briefly, 100 μL of concentrated HCl was added to 10 mL urine samples containing 1% TBA. This mixture was heated at 120℃ for 40 minutes to hydrolyze the MDA of urine samples. The resulting color complex was extracted with liquid-phase extraction by n-butyl alcohol and the absorbance of the organic phase was measured at the wavelength of 530 nm (26). Statistical analysis was applied using the JMP-7 software. The results were expressed as means ± standard deviation. The difference between subject and control groups was assessed with independent-samples student t-test. P values < 0.05 were considered as statistically significant. 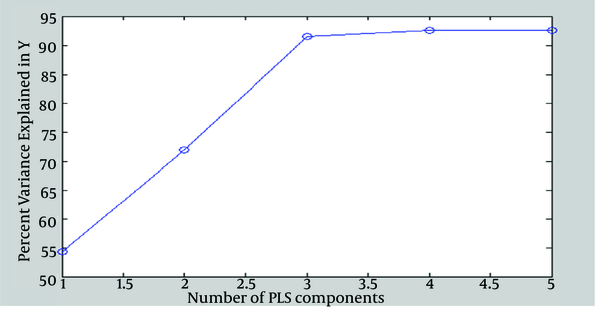 PLS is a common multivariable linear regression in chemometrics modeling. Y is defined as independent objects by m variable output matrix and X is defined as n dependent objects by p variable predictor matrix. Hereby, PLS is based on the simultaneous decomposition of X and Y into latent variables (T) and associated loading vectors (Q). Regression is performed on these components; thus, Y = TQ + E, where Q is a matrix of regression coefficients (loadings) for T (27). In this study, we considered MDA concentration in urine as Y, and the urine concentration of chromium, cadmium, and lead as well as FEV1/FVC, FEF25%-75% of spirometry index as X for the PLS analysis using MATLAB software. Biological monitoring of metals in fume exposure is shown in Figure 1. MMAW workers had signiﬁcantly higher levels of urine chromium concentration than controls (P < 0.002). The mean values of chromium in urine samples of welders and control were 2.32 ± 0.77 and 1.16 ± 0.435 µg/L, respectively (Figure 1). The Results showed that cadmium and lead concentration in welders' urine was higher than controls; however, the difference was not significant (Figure 2). Although the concentrations of carcinogen metals in the urine of welders were higher than those of controls, both of them were much lower than BEIs (Table 1). MDA level as lipid peroxidation marker for workers were also signiﬁcantly (P < 0.01) higher than that of controls (mean ± SD, 11.17 ± 4.23 and 4.83 ± 1.182 mM, respectively; P < 0.01). Input matrix (40 × 5) sorted in data sets composed of 30 training variables and ten testing variables. Data were modeled with PLS analyzing to predict pattern for oxidative damage. To choose an optimized number of principal components (PCs), we examined the mean squared prediction errors between the measured concentration of MDA and the predicted oxidative damage with increasing numbers of PCs. Figure 3 shows that the mean squared prediction was minimized with just three PCs for the PLS model. In order to evaluate the performance of the models, correlation coefficient (R2) values for observation and predicted oxidative damage were used. When the model was performed for the training dataset, MDA concentration in testing dataset was predicted using the rules of PLS model. There were suitable correlation with the regression of R2 = 0.91 for anticipating oxidative damage in testing dataset. The results of this study showed that urine chromium concentration and MDA, as oxidative damage indicator, were significantly higher in welders in comparison to the controls. Mean concentrations of chromium, cadmium, and lead in urine of MMAW workers were 2.32 ± 0.77 µg/L, 0.45 ± 0.011 µg/g creatinine, and 0.94 ± 0.04 µg/g creatinine, respectively, which were lower than other reports (7). Exposure to multi-metals such as lead, cadmium, chromium, molybdenum, and magnesium is reported in welders (28). Whereas steel, iron, and stainless steel have to be added to this study; exposure to chromium is highlighted in biomonitoring of MMAW workers. Urinary concentration of chromium among subjects was twice as great as controls. 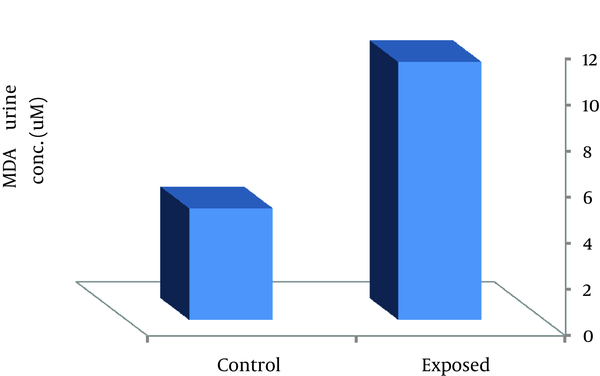 Previous investigations have demonstrated that in addition to the air monitoring in occupational exposure, metal assessment in biological samples is suitable for hygiene engineering control (29); however, researchers have obtained weak association between airborne and urinary concentrations of metals in welder (7). Moreover, our results showed, urine concentrations of metals were lower than BEIs (30) whereas oxidative stress was occurred in exposed group. It seems that in multi-metal exposure, metal estimation in biological samples could not characterize the toxicity and synergism effect. Similar trace effect of metals toxicity such as oxidative damage is more suitable for multi-metal damage estimation. Exposure to metals in welders has been reported frequently (5, 31). The base of this study was oxidative damage and MDA production in metals-exposed population (15, 16). Since lipid peroxidation produces MDA (32), we measured the excretion of MDA in urine of MMAW worker from a PTM factory for oxidative damage estimation. Metal exposure was assessed by measuring chromium, cadmium, and lead in urine sample. Approximation of oxidative stress is not a routine experiment in usual laboratories. In this work, we suggest prediction of oxidative damage using common biomonitoring assessment. Estimations of oxidative stress among the multi-metal exposure helps to distinguish people with higher priority for monitoring. With regards to identifying damaged group based on the oxidative toxicity, management control and engineering control measures could be justified. Funding/Support: Financial support for this work was provided by Department of Occupational Hygiene, School of Public Health, Shahid Beheshti University of Medical Sciences, Tehran, Iran.